Whether at a groundbreaking ceremony or the job site, this hard hat will be a standout with its solid black shell, and replaceable soft brow pad. 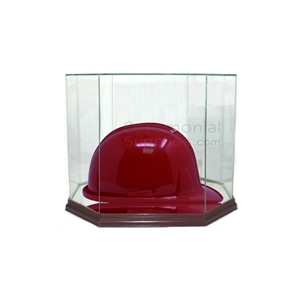 The shell is made of high density polyethylene and has been kept blank for customization. 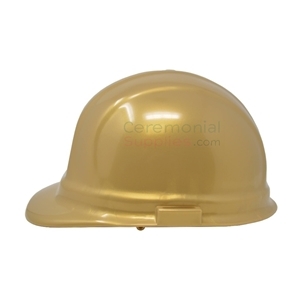 The bright yellow groundbreaking hard hat gives your ceremony a colorful boost. Though it is specially colored and fully customizable for groundbreakings, this hard hat is the real thing. With an adjustable pinlock suspension, replaceable soft brow and option to accommodate chin straps, this ceremonial hard hat will fit any head size and would perform quite well on the job site if need be. It is composed of high density polyethylene materials that make it durable. A hard hat can be both regal and serviceable. 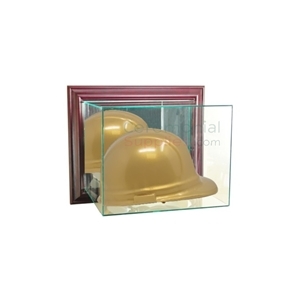 This golden hard hat is exemplary of both; it comes with an adjustable pin lock suspension and replaceable washable brow pads but the shell, although sturdy enough to meet industrial safety standards, has a golden finish that speaks volumes of its ceremonial appeal. This hat, made of hard plastic and weighing 12.76 oz, comes with a slide-lock for targeted head sizes 6.5-8 and allows for a customizable fit. Both solid enough to serve industrially and attractive enough to please the eye, this hard hat is a jack of all trades. With its polyethylene shell, pinlock suspension, replaceable brow pads handling the heavy work and its blue customizable shell taking care of your aesthetic and marketing needs, this hard hat will serve all your needs perfectly. With the versatility provided by its classic design and high density polyethylene build, this orange ceremonial hard hat is a perfect fit for your groundbreaking’s needs. The adjustable pinlock suspension and replaceable soft brow pads make it ready for industrial use, while the blank orange shell serves as a canvas for marketing opportunities most useful at project kick-off events. A hard hat that is both functional and ceremonial. This silver colored hard hat comes with an adjustable pin lock suspension and washable brow pads that make it apt for actual work on the field but its design and silver color make it a premier accessory for groundbreaking participants. The hat is made of hard plastic and weighs 12.76 oz. The provided slide-lock with intended head sizes 6.5-8 allows adjust-ability for a snug fit. Groundbreaking ceremonies tend to be a rather special affair, and to that effect, organizers usually go all in with the decorations. Ceremonial hard hats are wearable decorations that impact the overall look of the groundbreaking stage; they are granted the same importance as ceremonial shovels by event planners, and for good reason. Hard hats are perfectly aligned with the groundbreaking theme and coordinating the right one with the event’s décor will go a great length for the ceremony’s purpose. A groundbreaking ceremony is conducted to usher in an auspicious beginning for the project at hand, after all. Furthermore, seeing as to how a successful ceremony motivates all parties associated with the project and reassures them of the strength of its vision, it is fitting that a groundbreaking ceremony be held that is as grand as the idea itself. As with any ceremony, a groundbreaking ceremony relies considerably on its aesthetic appeal, an element that can be controlled by the judicious use of decorations. While groundbreaking ceremonies employ decorations such as ribbons and bows, they are only made whole by two specific decorations, the ceremonial shovel and the indispensable ceremonial hard hat. Ceremonial hard hats are not unlike the hard hats designed for industrial use, but with a small difference. While standard hard hats are more perfunctory in nature, with protection as their primary objective, ceremonial hard hats have a focus on design as well. This differentiation exists as ceremonial hard hats are by disposition a symbolic accessory. The people involved in groundbreaking ceremonies are not actively involved in the construction process. That is not to say ceremonial hard hats are short on protection; with their professional grade shell construction, they are as equipped to serve as traditional hard hats, albeit they are more design oriented because of their users and their desire to use ceremonial hard hats in photo opportunities. Because of their primary focus on aesthetics, ceremonial hard hats are available in a wider gamut of colors than standard hard hats. Organizations often choose the color most suited to go with the decorations, either by complementing them or contrasting them. Moreover, at times the organization may choose to reap the benefits of the psychological connotations of the various colors the ceremonial hard hats are available in, and control the image their business is projecting. For that very purpose, ceremonial hard hats also tend to have blank shells. The blank shells allow a degree of customizability, and depending on their objectives, the organization may choose to have their logo on the hard hats for marketing purposes. They may choose to otherwise inscribe the hard hats so they make for keepsakes, such as by individually inscribing the names of the ceremony’s participants on them. Ceremonial hard hats are an extremely versatile accessory, and with the myriad of uses they find, it is not hard to see the appeal behind them. Perhaps owing to the same, ceremonial hard hats have become some of the most popular accessories when it comes to groundbreaking ceremonies. CeremonialSupplies.com recognizes this growing demand for ceremonial hard hats, and maintains an extensive collection of ceremonial hard hats in a wide range of colors to make sure their patrons have the most hassle-free experience possible while shopping for ceremonial hard hats. 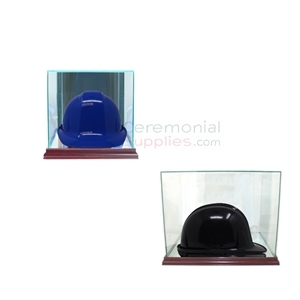 Peruse through our selection of ceremonial hard hats and discover the one that represents your brand most competently.